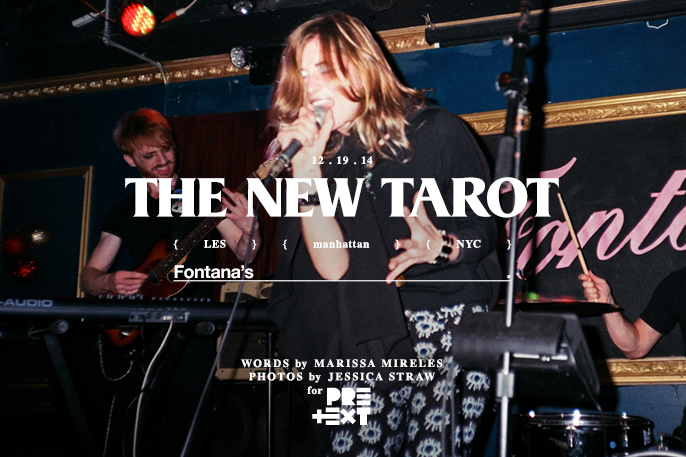 In recent news, fellow humans, I had the transcendental experience of enjoying a live performance by Brooklyn-based power pop newcomers, The New Tarot, fronted by the Walker sisters, Monika (vocals, guitar) and Karen (keys, vocals) and with Dan O’Connor (drums), Ryan Ashe (lead guitar), and David O’Connor (bass, vocals). Having recently re-moved to New York City I am continually finding new bars to spend money in, and the beautifully lit two-level bar Fontana’s, in Manhattan, was pretty rad in comparison to some of the others I have been to as of late. The initial energy was inviting–no nonsense at the door and the audience awaiting The New Tarot’s performance of were all ages and sorts. This indicated to me a lot about the quality of the music having only heard of The New Tarot the previous week and arriving with few expectations. That said, I was pleasantly surprised. The room where the stage was set felt spacious and secluded at the same time; it had various hallways and open space to move around and dance if you wanted but also had a private feel depending on the location. The audience that occupyied the entire room all seemed to be there to have a good time and to vibe out, so the equilibrium was set and ready to go. As soon their set began, The New Tarot emanated a tone that was ethereal and divine–definitely–but it must also be said that the music felt very real and tangible–as if I had taken a time machine back to the era of late night gigs for 50 bucks from bands like Fleetwood Mac and when Kennedy was president. As for the experience of the individual songs, it was as if a consummation had occurred thousands of years ago between a star and a Grecian goddess and the union was finally exploding in real-time. 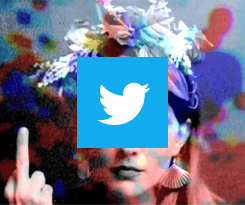 The electricity was undeniable, the performance had everyone in the audience attracted, allured…very much submitting to the music’s agenda to impose something magical and fable-like upon them. It wasn’t like us, the audience, had any other choice in the matter; the band conducted itself in a way that made us sitting ducks–trees waiting to be engulfed in fire. The dichotomy between the subdued, demure poise of the pianist Karen and the bold, intense energy of the siren Monika left many mouths agape and dripping saliva. Monika’s movements were like echos, all encompassing gestures and sways that left the entire room in a sort of electric box full of heat. Devoid of time and self-awareness. The interludes between the sets were just as interesting. The band, while appearing as a cohesive unit, were also singular and defined in their own entirely individual personalities. Despite performing songs as if they had shed their human form and become conduits of light and sound, the band came across as laid back, socially aware, and very interactive with the audience. To experience The New Tarot for yourself, their upcoming show dates include: Jan 24 (Mercury Lounge, NYC), Jan 30 (Rockwood Music Hall, NYC), Feb 14 (Arlene’s Grocery, NYC) & Feb 27 (The Bitter End, NYC).